We have officially entered the complexities of investing profitably in this review. Please click here for part 1, here for part 2 and here for part 3 of the previous reviews. This book is really an investment classic and should be read and reread several times over to maximize our investment perspectives. Ask oneself if better than average results can be assured by choosing the right funds, performance funds? If not, how can one avoid choosing a fund that will garner worse than average results? How to make a decision between the different types of funds? Does the fund's performance justifies all fees required by the fund in handling your money? However, I would argue that funds with a protracted period of high past returns are likely to remain winners like Berkshire Hathaway and many other funds operated by investment legends like George Soros, Peter Lynch and more. Adding on to the point about sheepish behavior, once a fund grows to a certain size, the manager will tend to be less risk taking as they do not want their fees to be affected. This will affect the initial strategy used to get the fund to the size in the first place, affecting overall returns. As shown from the various factors behind a fund's lacklustre performance, it would be wise to purchase an index fund via dollar cost averaging. This way of investing has been advised by both Benjamin Graham and Warren Buffett due to an index fund's low expenses. For example, a typical stock fund incur operating expenses of 1.5% and trading costs of 2% while an index fund incur just 0.1% in trading costs and 0.2% in expenses. Moreover, their long term returns usually beat the returns of many stock funds. The only demerit behind index fund is that they are boring and one cannot go around boasting about how they are owing one of the most spectacular fund to their friends and families. Yet, by buying into an index fund, one is guaranteed to beat the vast majority of investment professionals and individual investors alike. After the above few factors, look at the fund's expenses, riskiness of the fund, manager's reputation and then past performance in the order listed. One should never buy or sell solely based on the recommendations received from financial service firms like investment banks, financial research firms etc. Instead, the role of the financial service firm becomes more of a knowledge provider in helping one make investment decisions. Under these situations, an experienced investment professional will be able provide a peace of mind to you such that you are able to concentrate on your day to day tasks. Of course, as with other advices laid out in this and previous reviews, always be cautious and know what you are buying. There are many questions you should ask your financial advisor should you decide to hire one and do refer to the official book for the complete list. The basic principle is to always understand what you are getting into and whether the advisor is trustworthy enough. The list is not conclusive and is subject to more factors. With regards to growth stocks, much emphasis has been placed on valuing them in recent years, whereby the technique used are often sophisticated and complicated. However, there is a certain paradox that comes with using techniques to value growth stocks and that is mathematical valuation has become most prevalent in an area where one might consider it to be the least realisable. This is because anticipation of the future takes a far higher weight than past performance. As opposed to the 7 years average test, one should use the "poorest-year" test to gauge the attractiveness of a bond purchase. 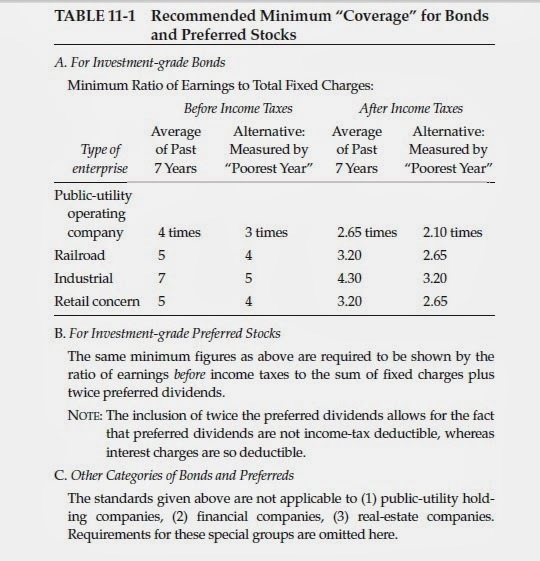 As shown to the left, it would suffice if the bond purchase met either of the 2 test. Moreover, when considering the poorest-year test, one should also take into account of factors like size of enterprise, stock/equity ratio, and property value. These factors are to ensure the validity of the bonds when the company goes into bankruptcy, preserving at least principal values. Do also be extra careful about overbonded firms as interest payments have a serious effect on net earnings. A low interest rate environment should not be expected to last forever and hence, the intelligent investor must exercise extra caution when making his investments in bonds. Expected earnings and dividends would have a smaller present value given that higher interest rate is assumed in the future. Following the various points in this review, a lot of the content in the book after the above point is mainly discussion based, analysing the significance of per share earnings and actual per share earnings.